At first glance, order the McNay Art Museum’s Majority Rules: A Decade of Contemporary Art Acquisitions reads merely like an eclectic hodgepodge of twelve unrelated works in various media. But it’s also a window into the museum’s contemporary collecting strategy, illness which is as much about educating a group of McNay patrons and giving them a sense of ownership of the collection as it is about the artworks themselves – for better and for worse. As the show reveals, over the past decade the forum has voted to acquireworks by John Miller, Ed Kienholz and Nancy Reddin Kienholz, John Fraser, Susie Rosmarin, Lesley Dill, Sandy Skoglund, Chakaia Booker, Roger Shimomura, Lance Letscher, Whitfield Lovell, Radcliffe Bailey, and Vik Muniz. Given that the McNay’s post-World War II collections already include paintings by abstract expressionists Joan Mitchell and William de Kooning, kinetic hangings by Alexander Calder, and sculpture by Donald Judd, the new acquisitions try to complement these prestigious works, but sometimes fall flat when compared to the dynamic aesthetic and timelessness of this stable. 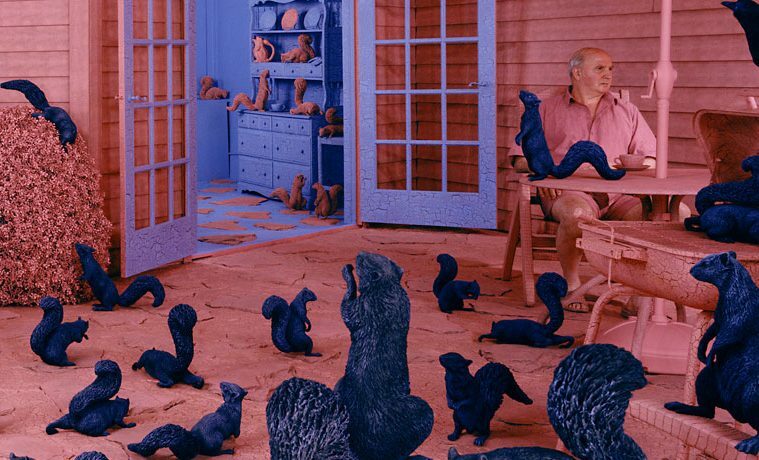 IMAGE: Sandy Skoglund, Gathering Paradise, 1991. Cibachrome print, 47 ¼ x 61 in. Museum purchase with funds from the McNay Contemporary Collectors Forum 2006.52. © 1991 Sandy Skoglund. Barilleaux says each body of work presented to the membership has been chosen with the purpose of strengthening the existing contemporary collection in some way, but also enhancing dialogue with other McNay holdings. For example, Vik Muniz’s Mill in Sunlight, after Piet Mondrian from Pictures of Pigment was showcased to the membership because the painting that was referenced in Muniz’s work corresponds with the timeframe of Mondrian’s The Tree (1908), which is already in the McNay collection. Lance Letscher’s Funny Hat (2009) fit into the McNay’s collage collection, rooted in an important early Picasso collage. 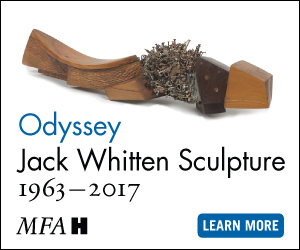 Other acquisitions were linked to McNay exhibitions: The forum voted to acquire Radcliffe Bailey’s Procession (2005) in the fall of 2011 in anticipation of his 2012 show. 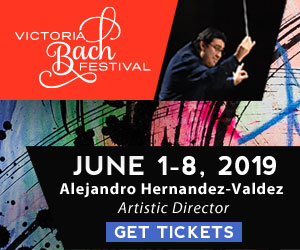 Running a gamut from minimal to experimental, from found-object collage to assemblage, Op Art to theatrical, Majority Rules makes an effort to touch on a variety of topics, but seems to exclude elements of Conceptual, Minimalist, and political artwork. 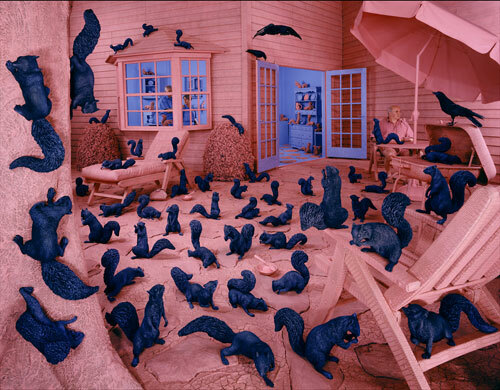 The invading monochromatic army of sculpted squirrels in Skoglund’s surreal staged photograph Gathering Paradise (1991) pairs well with the playful platoon of Japanese-inspired animé and manga characters that litter the flat picture plane in Shimomura’s acrylic painting Him-A-Hero (2006). The Op Art pieces are hung together, mixed with Fraser’s minimal Sol LeWitt-esque sculpture opposite Booker’s Dogon-inspired headdress made from cut, twisted and woven car tires. Lovell’s disturbing assemblage Cake Walk (2008) explores a precursor to blackface in which slaves twirled canes and danced in high society garments to entertain their masters, who awarded a cake to the best performer. Canes are precariously nestled underneath a Conté crayon drawing of an African American man on a discarded wood pallet, providing an allegory of the slaves’ humiliation and enduring stereotypes. Measuring nearly 14 feet wide, Bailey’s collage painting Procession reimagines the slave trade journey with coded symbols, heavy-handed paint application, mixed-media relief sculptures, and African masks, but it lacks the metaphysical mojo of the best of Bailey’s shamanism-infused works. Letscher’s collage Funny Hat has a conceptual drawing approach that uses found scraps of paper as material. Overlapping personal notes, school homework, children’s book illustrations and other rubbishy rubrics give it the derivative feel of a 1960’s conceptual drawing exercise reminiscent of John Baldessari. Now that the forum’s acquisitions have been displayed together for the first time, we begin to see the curatorial vision of a program that creates a sense of ownership for participating forum members and patrons. However, the buying power of this acquisition fund needs to be exponentially grown so the McNay is able to purchase more consistently first-rate works.